Caption Reads: She could no longer pretend that he wasn't an idiot. Serve up a side of sarcasm with your morning mug. 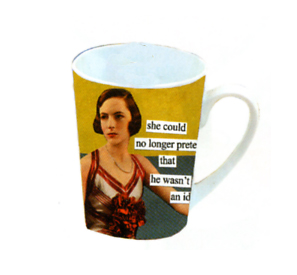 Humorist Anne Taintor offers her ceramic cups that will make any Monday more bearable. Featuring Taintor's classic scenes, these will surely get you moving - or at least smiling - in the morning. Dishwasher and microwave safe.